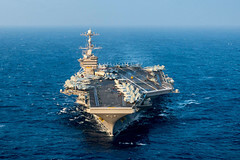 The aircraft carrier participated in a show of force transit training exercise with Carrier Strike Group 11 off the coast of Southern California, March 31. 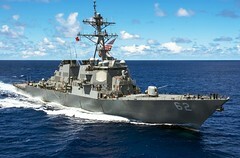 The guided-missile destroyer arrived in Subic Bay for a port call that highlights the strong community and military connections between the Philippines and the U.S., April 1. 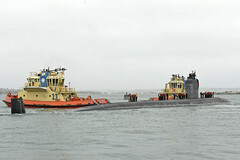 The Los Angeles-Class fast attack submarine returned to her homeport in San Diego, March 30. 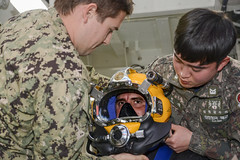 U.S. Navy and Republic of Korea Navy diving and salvage experts wrapped up nearly two weeks of advanced training during Salvage Exercise (SALVEX) Korea 2017, March 30. 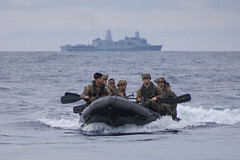 The Bonhomme Richard Expeditionary Strike Group (ESG), along with the embarked 31st Marine Expeditionary Unit completed a certification exercise, March 29. The guided-missile destroyers and embarked helicopter detachments will depart San Diego for a regularly-scheduled deployment to the Western Pacific, March 31. 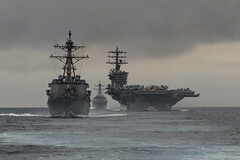 The Carl Vinson Carrier Strike Group and ships of the Japan Maritime Self-Defense Force (JMSDF) concluded a bilateral exercise in the East China Sea, March 29. 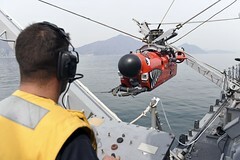 The USS Warrior (MCM 10) crew wrapped up a mine countermeasures exercise with the Republic of Korea Navy, March 29. The commander of Naval Air Forces Pacific announced USS John C. Stennis (CVN 74) as the recipient of the 2016 Battle “E” award for aircraft carriers homeported in the Pacific, March 28. 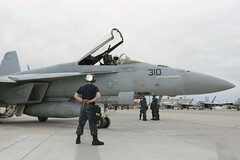 The Eagles of Strike Fighter Squadron (VFA) 115 recently completed the Strike Fighter Advanced Readiness Program training syllabus at Naval Air Station Fallon, Nevada.